Anyone who knows me well, knows I'm not an intrepid person. I'm scared of most physical activities that other people consider great fun; water slides, team sports, fast vehicles, Pokemon Go - you name it, I'm afraid of it. So it was with some nervousness that I signed up to travelling, earlier this summer, to British Columbia in Canada, an area renowned for climbing, hiking, water sports, skiing and general outdoorsy-ness. The itinerary was adrenalin-inducing, and even just on reading it I half-felt that I might not have the nerves of steel required for such a trip. But having been reassured by the lovely people at Destination British Columbia that the level of physical prowess needed was probably in the grasp of a sprightly octogenarian, I felt we were all on the same page. I suppressed all thoughts of helicopters, bears or helicopter-eating bears and decided it was time for little old me to step out of her comfort zone and into the Pacific North West. Vancouver - where we kicked off - is an exceptional city. Clean, green and cosmopolitan, clapperboard houses and original Art Deco street lighting sit comfortably cheek by jowl with glittering glass skyscrapers. Nestled between ocean and mountains, it's entirely possible to hit the beach for a swim or the slopes for a hike or a ski (depending on the time of year) within minutes of the city streets. Vancouverites tell me it is a place where people work to live, not live to work, and it has that palpable west-coast organic, foodie, environmentally-friendly vibe. We stayed at the five-star Shangri-La in downtown Vancouver. The hotel occupies the bottom 15 floors of Vancouver's tallest building and is contemporary Asian and luxurious in style and well placed as a base - close to nightlife, shops and shore. Market - a top class restaurant serving modern Asian/Canadian food and great house cocktails - kept us well nourished on site, and a trip to the Chi spa after a leisurely lunch for a steam and a delicious vitality massage, meant that even with the long flight and time difference, we were good to go and see what the Vancouver bar and restaurant scene had to offer on our first evening. 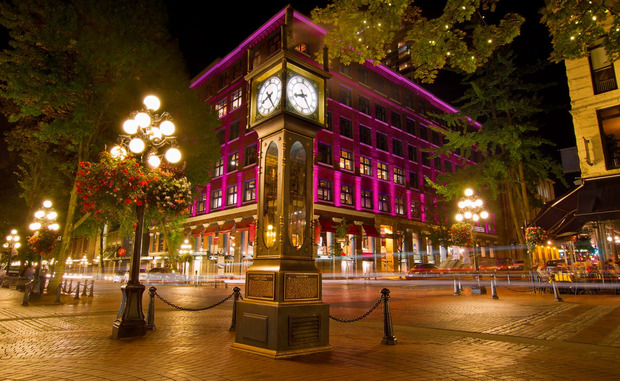 We hit Gastown - the oldest part of Vancouver. It's a pretty collection of sunny, red brick streets and squares and clearly where the uber-hip go to see and be seen. We started with dinner in L'Abattoir, a very cool, urban chic restaurant on Carrall Street, just off the main square, between the historic Gaoler's Mews and Blood Alley. It is on the site of Vancouver's first jail which was in the meat packing district - hence the name. Industrial fixtures, natural wood and glass are the perfect backdrop to superb, locally-sourced, exquisitely- cooked seafood and Alberta steaks paired eloquently with wines from BC's Okanagan Valley. Ice wines are not all that Canada does well by a wide mile. Cocktails are another feature of Vancouver's nightlife and to help our digestion we sampled two of the finest cocktail bars in Gastown, The Diamond and Pourhouse. Friendly, casual sophistication is the best way to describe the bars in this area. During the short stroll back to our hotel we were joined by one of the locals, a skunk... The eight hours time difference and some super comfortable beds meant we slept the sleep of the dead. The gourmet theme was continued the next day during a trip to Granville Island for a tour of its artisan food market, micro distillery and wine shops. Food is clearly very important in Vancouver and sourdough breads, speciality charcuterie and farmhouse cheeses made a satisfying start to the day. There's a lot of emphasis on farm-to-plate and organic production, and the vibrant semi-industrial backdrop of the market could teach us a thing or two about how to develop run-down parts of own cities. We ate Rainier cherries in the sunshine overlooking the Fraser River where it's quite normal to see men in suits paddle-boarding beside speedboats, ferries and seaplanes. The Liberty Distillery, where we unsurprisingly met a chatty Cork man in charge of the stills, introduced me to the new concept of golden gin, and a vodka so smooth you could drink it neat. The afternoon was whiled away on a fabulous bike tour of the city. Cycle City Tours have it nailed with electric bikes that take all the effort out of any minor incline. 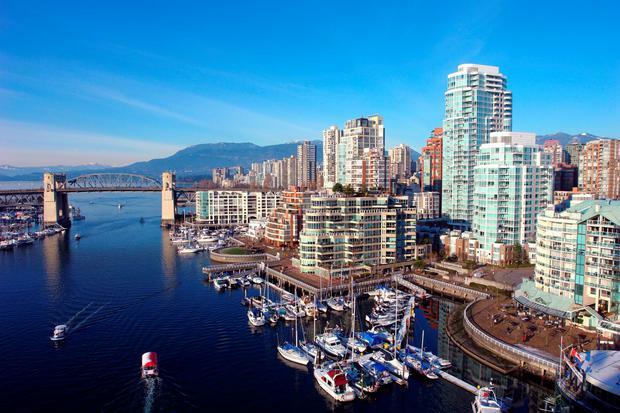 The relaxed, picturesque tour takes you to historic buildings and along the sea wall, past beaches and views of the city skyline and brings you through Stanley Park, a lush verdant jewel in Vancouver's crown, with everything from pockets of temperate rainforest, to lily pads and beaver damns on hazy ponds. It even takes in majestic First Nation totem poles. Our guide was a font of local and historical knowledge and great craic too, and the fact that bikes in Vancouver are mostly kept away from motorised traffic made the whole thing safe and fun - unlike cycling in Ireland. We topped off the evening with the Fly and Dine Bowen Island tour, taking off from Vancouver harbour in a seaplane (be still my beating heart) with Harbour Air, and flying low over the scattered green islands and sparkling sea until we landed at the jetty on the idyll that is Bowen island. We had dinner and drinks in the open air by the water's edge. This was an unforgettable experience, like a cross between 007 and Grizzly Adams, that brought back memories of my J1 youth. The next day it was back out on the water with Prince of Whales Ocean magic for whale watching. We enjoy a gorgeous tour of the BC coast and islands on an open-top boat (bring a windcheater) with the added adventure of possible whale sightings thrown in. Not everyone sees whales, but we were lucky and met a pair of these majestic creatures far out into the waters near the US/Canadian border. They swam slowly around us, moving elegantly through the water, and it was impossible not to feel awed. Our last leg of this whistlestop tour of Vancouver was a trip up Grouse Mountain, the peak that towers over the city and the playground of skiers and hikers for miles around, just a 20 minute ride from the city. We ascended the mountain in the gondola to incredible views and ambled around the halfway point taking in a lumberjack show and being introduced to the ridiculously adorable Grinder and Coola, two orphaned grizzly bears. A further ascent, this time on a ski lift - which when it's not over a blanket of snow is not for the faint-hearted - took us to the peak of Grouse and the Eye of the Wind - a wind turbine you can climb inside so you're on the very top of the top of Grouse. The views are stunning, though the glass floor made some people nervous. Grouse was topped off by another serving of BC's finest food at the Observatory restaurant - a place popular for weddings and engagements. A squeaky bum descent from the mountain this time on the roof of the gondola we'd gone up in, and another incredible day was chalked up. The last part of this incredible Vancouver stay was one I was most thrilled about and also dreading - the Compass Heli Tours helicopter tour of the glaciers above Vancouver. I barely like flying in jumbo jets and had always sworn I'd never go up in a helicopter but up I went, and it was amazing! We flew high over forested valleys with shimmering lakes - like a scene from Mission Impossible until we got higher and soared past ice-capped, craggy mountains and virgin snow. We landed on a glacier beside a frozen lake that was just thawing at its edges so was ringed by bright turquoise meltwater - which we kayaked through. It was a total pinch-yourself experience. From there we travelled on to Whistler, a modern, upmarket ski resort north of Vancouver. Like the rest of BC it is also beautiful in summer, boasting stunning scenery and lots to do and see. We stayed in The Westin Resort & Spa and on our first night ate at Alta Bistro and once more found the Canadian locally-sourced food and wine to be fantastic. The highlight of Whistler, and perhaps the whole trip, was a second helicopter tour. This time we flew with Headline Mountain Holidays to Canada's southernmost ice fields and landed on the glacier roof of prehistoric ice caves. This once-in-a-lifetime experience sees you hiking through caves deep under the glacier with only a thick layer of ancient ice glowing psychedelic blue above you. It's a surreal landscape and one which may not be around for much longer. A gourmet lunch on the ice cap followed, and things couldn't have been more perfect! To warm us up after the only-mildly chilly ice caves, we headed to the Scandinavian Spa in Whistler where we heated ourselves in outdoor hot tubs and got pummelled by sure-handed masseuses. A last long-table dinner in The Grill and Vine in the Westin resort - shared platters are a big thing in Whistler - and more excellent BC wines with maple whisky sours to finish, ensured another perfect night. After loading up with some fabulous moose, bear and maple syrup-themed souvenirs, sadly I was on a flight back to Dublin. My only worry now is, how will I manage to get back there again, and this time bring my whole brood with me? Scott Dunn offers a seven-night trip to British Columbia from €7,356, per person based on two people staying at The Shangri-La, Vancouver, and The Westin Resort and Spa, Whistler, room only. This includes: glacial kayaking with Compass Heli Tours; helicopter ice cave tours with Headline Mountain Holidays; car hire and international flights. For more information or to book visit www.scottdunn.com, or call 00 44 20 8682 5030. For more information about British Columbia or Canada, visit hellobc.co.uk and explore-canada.co.uk. Air Canada (aircanada.com) also offers daily direct flights from Dublin to Vancouver and flights via London Heathrow. Ciara (@ciarakellydoc) presents 'Lunchtime Live' on Newstalk, weekdays from 12-2. The Canadian Bucket List: 30 things to do in Canada before you die!